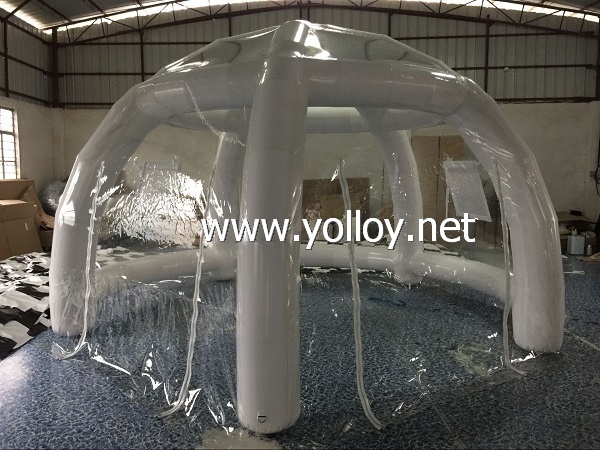 As for the Inflatable clear spider dome for party camping，we make it in Commercial grade Clear PVC and PVC tarpaulin,which is high durable. Since the inflatable legs of the tent is sealed structure,so it needs the air pump to inflate it,once inflating, it can keep the inflatable shape for many days, not need the air pump to inflate it all the time. 1. We will reply your email as soon as we receive it. 5. We follow-up your after-service, if anything don't be satisfied, please let me know. We do our best to meet your demand and solve problem. 1)Our material is flame retardant, water proof and lead free, and has passed CE, EN, RoHS, SGS, ISO, ensuring high quality and long life time. 2)Specializing in inflatable products over than 10 years, with experienced and professional designers and production staff members. 3)Own advances techniques and high-tech equipments. 4)Self-owned brand and independent manufacturer, with High quality and best service as well as competitive price. We can make the tent according to your requirements, such as your size, color, and design, and we can also put your logo on it. We are professional manufacturer of inflatable tent, our main products are: Inflatable tent, inflatable advertising, inflatable water games, inflatable combo, inflatable castle, inflatable bouncer, inflatable slide, inflatable fun city, inflatable sports games, inflatable decoration, inflatable model and so on.